A Countess from Hong Kong :: Movie Information :: RabbitTV GO! 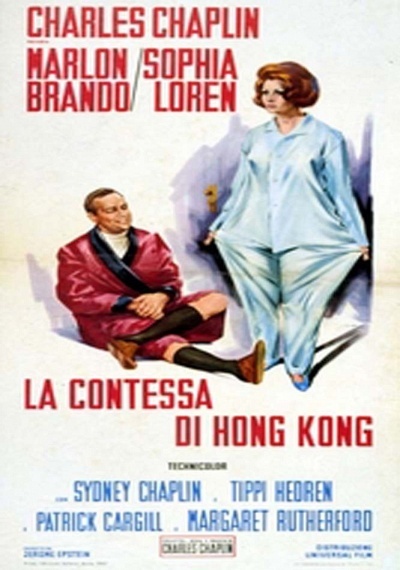 Leaving Hong Kong after a stopover, an American diplomat (Marlon Brando) discovers a stowaway in his stateroom -- the Countess Natascha Alexandra (Sophia Loren), whose family has fled from Russia. Fearful of losing his job, he tries to keep his new roommate hidden while they both try -- unsuccessfully -- to keep from falling in love. Countess of Hong Kong was director Charlie Chaplin's last film (and the first since 1923 in which he didn't star).